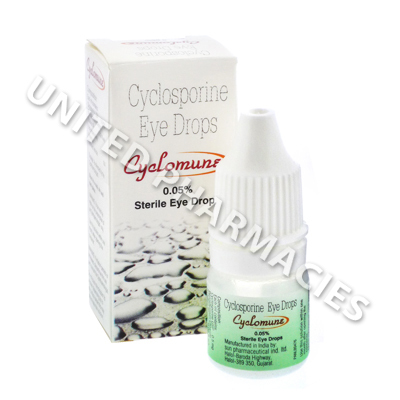 Cyclomune Eye Drops (Cyclosporine) are used by patients suffering from a condition called keratoconjunctivitis sicca. This condition is more commonly referred to as chronic dry eye, and can be caused by inflammation. Cyclomune Eye Drops (Cyclosporine) are used by patients suffering from a condition called keratoconjunctivitis sicca. This condition is more commonly referred to as chronic dry eye, and can be caused by inflammation. The active ingredient in these eye drops is a type of immunomodulator, and it works by reducing swelling, which in turn leads to an increase in the production of tears made by the eyes. Cyclomune Eye Drops (Cyclosporine) comes in the form of an emulsion (a mixture of liquids) which you need to apply directly to the eyes. Consult your doctor prior to commencing treatment, so that the correct dosage can be prescribed. There is a possibility that you will be told to administer it to each eye twice per day, usually at 12 hour intervals. All patients should note that it is extremely important to ensure that the dropper does not become contaminated, as this could cause an infection or other eye condition. While you are using these eye drops, it is important to be aware of the risk of side effects, and to tell your doctor about any reactions that occur. There is also a risk of more serious side effects. Consult your doctor or seek medical care immediately if you notice any other more serious reactions. If you have an eye infection or have ever suffered from a similar type of infection in the past, it is necessary to inform your doctor before you begin using these eye drops. Remove contact lenses before you apply the drops to your eyes. Your doctor will most likely tell you to wait 15 minutes after application before you apply the eye drops again. Always use Cyclomune Eye Drops (Cyclosporine) as you have been prescribed by your doctor. Never self-medicate or change your dosage without first consulting your doctor. The correct dosage can vary depending on your health, medical history, and the severity of the condition being treated.